The roof rack is the ultimate accessory for any vehicle. Whether you’re looking to carry a bike, your skis, surfboard or even add a cargo box for that all-important vacation; the right roof rack will make this possible. Perhaps the greatest part of having a Thule roof rack isn’t that you have a premium, quality product; it’s the fact that they can be fitted to virtually any vehicle. Even if you have a small car you’ll be able to add a Thule roof rack and carry things that would otherwise be much too big. In short, the right Thule roof rack is much cheaper than having to replace your car! But, unsurprisingly there are many different types of roof racks on the market. You need to understand the range that is available before you can choose the best Thule roof rack for your needs. Fortunately, that’s what this guide is for! Discover the best Thule roof rack, check out the Thule roof bike rack, get help choosing the right rack and learn how to fit the Thule roof rack onto your vehicle; it’s not as hard as you may think. Thule has been operating since 1942. The company was founded n Sweden and has maintained a dedication to improving your ability to travel with any type of gear. It doesn’t matter if you love to surf, have kids or are moving; there is a Thule roof rack that has been designed to help you achieve your goals. In fact, Thule has cleverly designed several of their racks to be able to accommodate different fittings; making it possible to carry a cargo box and your bike or surfboards. The basis of all their designs and the key to getting the right roof rack system is in the flexibility offered by Thule. All their racks are adaptable and can have extras loaded onto them; as you’re about to discover. The basis of any roof rack is that it consists of two cross bars designed to support the weight of any object while spreading this weight across the roof of the car. In this way, you can carry heavy or bulky loads. This is a great option if you have limited space inside your car, walking with the item is not usually an option. These are generally the most common type of roof rails. They run the length of your roof but they will rise away from the roof. In doing so they’ll create a gap between the rail and the roof. This is the part of your car where dirt will collect the most. The raised roof rail allows you to fit almost any crossbar providing you have the right fitting kit. The alternative is a flush mounted roof rail. This doesn’t have the gap between it and the roof. These are actually more aerodynamic. They provide the same service but you’ll need a different type of fitting kit to add a roof rack to this type of rail. It is worth noting that the roof rails on vehicles can all be different. Thule specializes in either square crossbars or aerodynamic ones. These are designed to minimize drag while giving you a strong surface to attach your Thule roof rack too. There are other makes available but Thule products tend to be some of the best on the market. You won’t be surprised to discover that the Thule square bars are the most basic option of the Thule roof rack system. What may surprise you is the fact that they are in the number one position on this list. There is a simple reason for this; they are reasonably priced, well made and incredibly versatile. The square bar is made from galvanized steel with welded seams; it’s strong. The steel is coated in rubberized plastic which protects the metal and anything that you load on top. You can purchase the bars in several different lengths; 50”, 58”, 65” and 78”. That means there is enough variety to fit any vehicle and give you the space you need. Just remember that in most places you can’t have a roof rack wider than the wing mirrors of your vehicle. These bars are sold as just bars, to fit them to your vehicle you will need to purchase the towers and the mounting kit. You’ll also need the end caps; these don’t just make the Thule roof rack look good; they also protect the metal; preventing it from rusting. The bars will be clamped to your vehicle with patented MaxClamp technology. This works with an integrated AcuTight tensioning tool which will tell you when the bars are tightened properly and its all safely fitted to your vehicle. That’s a great way to get peace of mind! Despite having to purchase a variety of parts separately Thule has worked hard to introduce a system known as EZA; this means there are as few parts as possible involved in the installation. In fact, there are 50% less than similar systems from other manufacturers reducing the installation time by as much as 50%. Of course, you will need to use Thule’s square bar towers as these have the right size and shape holes for these bars. The great thing about this set up isn’t just that it will fit virtually any vehicle. The bars sit in the mounting towers and actually have a relatively high clearance from your roof. This is advantageous when you are loading irregularly shaped objects; they can hang between the bars without risking them touching and damaging your roof in transit. These bars are capable of carrying 165 pounds of weight. You can buy them individually or as a pair; depending on your preference. They also have a cover that sits over the tower; this is locked in position preventing anyone from tampering with your bars once they are fitted. To finish you can lock the towers to your roof with the same key. In contrast to the other Thule roof rack systems on this list, this is actually a complete setup. The complete CrossRoad system from Thule is designed to give you everything you need to get the bars onto your car and hit the road. You’ll get 2 square bars, feet and the locks to secure it all to your vehicle. The square bars are the same as those described already. They are made of galvanized steel with welded seams to ensure maximum strength. The square design is less aerodynamic than some of the other Thule roof rack systems but this helps to keep the cost down; making this one of the cheapest options available. However, unlike the first entry on this list, you’ll get everything you need when you buy this package; providing you can find your vehicle in the list. This is why they are second on the list; buying the square bars and making your own set up gives you more flexibility which is essential if your vehicle is not one of the most common ones. The Complete CrossRoad doesn’t just come with the bars, feet, and locks; you’ll also get all the tools you could need to fit it onto your vehicle. This particular pack can be purchased in a variety of sizes including 58”, 65” ad 78”. It is capable of handling 165 pounds but you can’t use the T track to mount it to your roof. What is really great about this Thule roof rack system is the ease in which you can attach it to your vehicle and the fact that it can fit any type of roof rail. Because the crossbars are held in place with straps they are capable of wrapping round square rails, round rails or even aerodynamic rails. All you need to do is loop the strap around your roof rails and then slide it through the clip. The easy fasten system will then allow you to tighten the strap to the right pressure; ensuring the crossbars don’t move while you’re in transit. The easy fasten system holds the strap securely preventing it from coming to lose. You also get a lock built into the mechanism to prevent anyone else from tampering with it. The bars slide through the top of the clamps and also lock into position using the same key. All you need to do is make sure the crossbars are positioned equally on both sides. You can then fasten on your load and hit the road. There is no doubt the Thule Aeroblade Edge Flush Mount is a stylish looking bit of kit. The bar is made of aircraft grade aluminum. This ensures it remains light enough to minimize noise and drag; even when driving at speed. It also ensures it is strong enough to support anything you want to put on it. The bar measures 47 inches long by 6 inches wide with a depth of 4 inches at its deepest point. The tapered edge helps to direct air over the Aeroblade Edge which prevents that whistling noise you so often get with roof racks. The bar weighs just 6 pounds; making it very easy to lift into position. The metal is powder coated and abrasion resistant; this is to ensure it will last for many years whether you take it on and off the car or simply leave it in situ. Unlike some of the Thule roof rack systems, the Aeroblade Flush Edge is complete. The foot is already attached to the bar at each end, making this a complete unit. It is worth noting that the towers may arrive attached to the bar but they are actually locked in position; you can remove them if you need to for any reason. You’ll get a key and a spare key when you purchase these roof bars. You will still need to purchases a mounting kit from Thule to allow you to install the roof rack easily and effectively. In a nice change to most roof rack systems, you can actually purchase this in either black or silver; depending on which you prefer. As well as needing a mounting kit it is important to note that the Aeroblade Flush Edge is sold individually, but you do still need two for your vehicle; unless you have your own plans for how to strap something onto one crossbar. It is also worth noting that the roof bars are designed to fit close to your roof; if you have a tilting sunroof it is likely that you’ll be unable to open it once the roof bars are in position. You should also be aware of the importance of measuring your roof before you buy. Thule has 3 Aeroblade Edge Flush mount roof racks; the smallest one has code 7601, medium 7602 and large 7603. Finally, it is important to note that the flat surface of these bars actually increases its ability to spread loads. This means the Thule Aeroblade Flush Edge is capable of handling 220 pounds; that’s a significant boost over the square bar offering from Thule. The second Aeroblade from Thule has many similarities to the Aeroblade Edge Flush mounted. It is also made from aircraft grade aluminum which ensures it is strong and durable. The bar has similar dimensions to the Aeroblade Flush; it is 47 inches long, 3 inches deep and 5 inches wide. Despite it’s slightly smaller profile it still weighs 6.74 pounds and can support weights up to 250 pounds. It is advisable to check the load rate of your roof as no matter how high the bars are graded your roof will have its own limits. Again you can choose between small, (7501), medium (7502) and large (7503) depending on which will fit your car. This is sold as an individual item but as Thule explain; this is because so many cars today have contoured roofs. The contour can change the width of the second bar or even the height of the vehicle. You may find that you need one flush mount and one raised to get a level load space. The Aerodynamic Raised Edge Thule roof rack has an integrated foot design; merging the foot and the bar helps to reduce wind resistance and decrease drag. This is aided by the design shape of the bars. You can choose to purchases these bars in either silver or black; both look good and both have locking mechanisms that secure the bars to the mounting kit. It is important to be aware that the name of this roof rack is relevant; it’s called raised because it is only designed to fit cars which have raised rails. To improve aerodynamics further and reduce noise the Raised Thule roof rack actually uses wind diffuser technology. You should barely notice the difference in your fuel consumption even when fully loaded. An interesting design feature is the use of Boxbeam loading structure. This ensures these aftermarket roof bars are the strongest bars in the world. You can attach these with the T-track system which will allow you to install it much faster than without it. You may need an adaptor to ensure your vehicle is compatible. Of course, as with all these Thule roof rack systems: you’ll need to check the clearance before you attempt to open the sunroof. You only get one bar when you order this but it does come with the feet attached and your unique key to enable it to be removed if necessary. You’d be forgiven for thinking this looks like a giant stapler because it really does! However, it is actually a very stylish and functional ski carrier. It is important to note that this mounts onto crossbars; you’ll need to buy these separately It will then transform your Thule roof rack into the perfect way to carry your skis. Add a cargo box and you’ll have all the space you need for your next skiing trip. The Snowpack is available in aluminum or black. As you can see it is hinged on one side; your skis or even a snowboard will slide into the opening and the top bar closes back down on them. The inside of the clamp I coated in soft rubber; ensuring the best possible grip without damaging the snowboard or skis. Perhaps the cleverest feature is the integrated vertical spring. This allows the Snowpack to close over a modern thick snowboard, an older style thinner one or even to lock shut with nothing in it. The vertical spring makes sure there is no gap when the clamp is shut; reducing the likelihood of whistling as you drive. The clamp is actually very easy to open; there is a large button on the end which can be pushed even if you’re wearing your big ski gloves; this helps you to stay warm before or after your snow session. You’ll also note that there are extension feet included in the pack. These can be slotted onto the bottom of the Snowpack; increasing the height of the clamp and improving the roof clearance for your skis. You will need to have Thule crossbars with a T track in them. The Snowpack can slot straight into the T track and lock into place without the need for any tools. All the hardware you need is already incorporated into the underside of the clamp system. This is the same system that locks your Thule roof rack to the roof rails; with the same key locking facility. Once the Snowpack is in position and your skis are inside it you can lock the clamp down and prevent anyone else from taking your skis. The loading width of this Thule roof rack is 29.5 inches. It can handle 4 snowboards or 6 pairs of skis. It weighs just 7.56 pounds; making it easy to put into position or remove when you’re not using it. 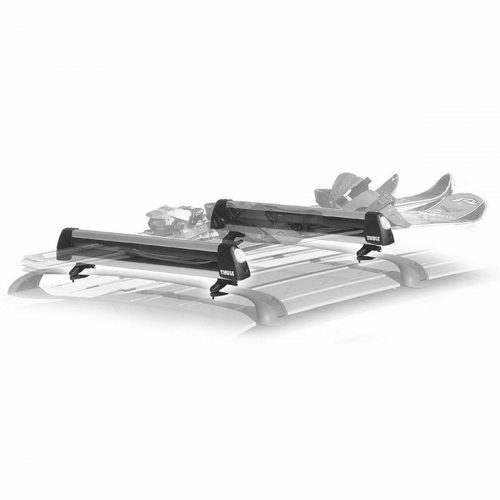 The Thule Universal flat top is another way in which you can carry your skis or snowboards. In fact, the clamps in this Thule roof rack system are very similar to those in the Snowpack. They are made of extruded aluminum and are only available in the one format. The inside of these clamps has the same soft rubber to protect your skis or snowboards. They are also capable of holding 6 pairs of skis or 4 snowboards. In fact, the only real difference between this and the snowpack is that you’re buying the whole kit, not just one clamp. Again you’ll need to have cross bars with either a T track or a universal speed fitting. This will allow the base of these clamps to slot into position. You can then wrap the straps around your crossbars and tighten them with the lever and built-in lock. Once tight they won’t come undone. The straps mean it’s possible to fit this universal flat top onto almost any vehicles as it doesn’t need to be Thule cross bars. Once in the grooves, you can actually slide these clamps into your perfect position. This can leave room for a small cargo box or even your kayak mounts. The Universal flat top is designed for use with skis whether they are in a bag or not but you can also use it for water skis or even a surfboard. Perhaps more impressive is the warranty that comes with it. It covers all defects but only while you own the Thule roof rack system; the warranty is not transferable. Each clamp is 33 inches long, slightly longer than the snowpack. They are 5.5 inches by 5.5 inches and when clamped shut without a load won’t allow air through; thereby restricting the amount of wind noise and whistling that you’ll hear. Of course, this may not be true once you’ve loaded your skis; it will depend on how well they are loaded. If you do detect a whistling once loaded it is worth investing in a wind deflector. This will remove the wind from the equation and prevent the whistling. It should also help with your fuel economy. It’s worth noting that despite being longer these clamps actually weighs less than the snowpack; they are just 6.5 pounds making them very easy to lift on and off or store elsewhere. They do have the same large push button which allows you to open the clamps even when you’re wearing your gloves. They also have built-in locks to secure the strapping mechanism to the crossbars and to secure the clamps in the down position. This is a great rack for virtually any vehicle providing you already have crossbars fitted. If you don’t then you’ll need to add the appropriate Thule roof bars for your vehicle and then clamp the Universal flat top in position. While you can attach anything to a Thule roof rack it is generally better to utilize a purpose-built roof rack appliance. This is especially true if you love getting out on your bike and want to be able to easily take it with you. The Thule 835 Hull-a-port pro kayak carrier is 5.5” high, 20” long and 11” wide. It is designed to fit on the Thule crossbars although it is designed to fit virtually any round crossbars or factory fitted roof racks. The rack itself is made of steel which is powder coated to ensure the metal is protected from corrosion. The frame has rubber pads to ensure the kayak is protected while it is sat in the J cradle. The idea behind this Thule roof rack is simple, by having a cradle for your kayak it will be easier to secure to your roof, safer and will free up more space on your roof for other items. Of course, as always you should be aware of how much weight your roof can support. The Thule 835 fits your crossbar with a simple clamp system. The bottom side of the clamp has easy operated knobs; allowing you to tighten the clamp securely in position. Once the bracket is in the position you can operate the lever and simply fold the clamp down. It then locks into position. Reverse this and you can open the clamp back up ready to take your kayak. Sliding the kayak into position is simple. It sits on a padded cushion; you then use the buckle straps to hold the kayak in place. You’ll also find a front strap and rear strap to secure your kayak to the front and rear bumpers. This will make sure it can’t move whilst you’re driving. 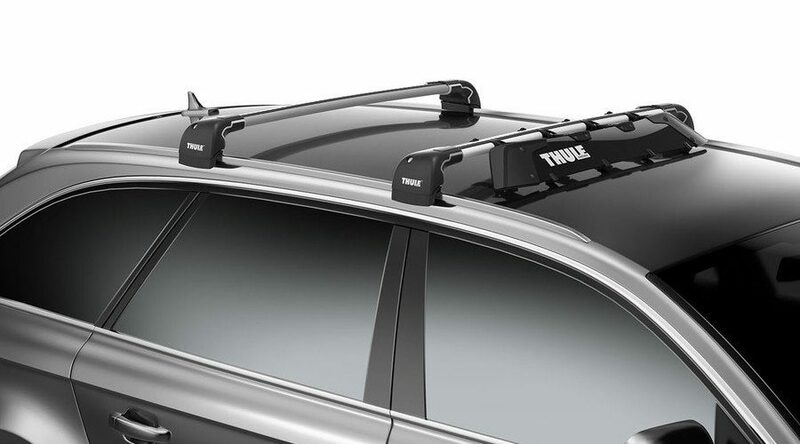 This Thule roof rack is black and grey. It weighs 12.6 pounds and can handle the weight of one kayak. You’ll get two brackets in one set and all the straps you need to ensure your kayak can’t move in transit. It is worth noting that the Thule 835 won’t bolt directly onto the Aeroblade Thule roof rack system; although it will mount to the square racks. You can purchase an Aeroblade load bar adapter which will allow you to clip this onto your Aeroblade bars. As with most Thule products, there is a lifetime warranty against defects but this can only be used by the first owner; the warranty is not transferable. The Thule 811XT Board is a complete Thule roof rack system designed to help you carry your paddleboard or a surfboard. It is well designed and surprisingly easy to fit; allowing you the most time possible in the water (or on it). It should comfortably fit one or two boards of whichever type you prefer. The reason this is possible is that it has a telescopic design. The brackets will slide apart as far as 34”; that’s wide enough for most boards. The boards themselves are protected from damage via the soft padding on the bars; this is designed to be water resistant. The dimensions of the 811XT are 6” x 23.3” x 3” and each one weighs 5.8 pounds. The thing to remember is that the 811XT actually consists of 2 bars. The bars are shaped like wedges to create a secure seating area for the boards. It is these wedges that slide in or out to create the necessary cradle for your boards. The end of each bar has a simple clamp system which can be fitted to square or round bars. Again this is not designed for the Aeroblade but it is possible to purchase an adaptor kit which will allow you to fit the Thule 811XT to the Aeroblade. To fit you simply place the clamp under your existing crossbars. Each side of the clamp has a threaded know; lift this up and it will slot into the gap in the top of the bar. You can then twist the easy turn knob to secure the clamp into position and prevent it from moving when you’re driving. As soon as you’ve fitted both bars you can put your boards into the cradle space and slide the holders closer together if needed. There are straps provided to wrap around the boards and the cross bars; effectively securing the board or boards ready for travel. The straps included are buckle style; ensuring the boards will stay snugly in position. If you’re planning to carry 2 boards don’t forget to use a cloth between them to protect the boards. This Thule roof rack system is made from steel which is powder coated to ensure it can survive the elements. The cradles for your boards are made of plastic but are strong enough to be used time and time again. However, it is worth noting that there is no locking mechanism included with this roof rack system. If you’re worried about the security of your boards or the rack you’ll need to purchase a cable lock separately and use it. Thule makes lots of different bike racks but the Thule roof bike rack is one of the best on the market. Although the Thule Upride can only carry one bike you can fit more than one of these to your roof; allowing you to easily carry a bike for all the family. The Upride Thule bike roof rack weighs 17 pounds and is 64” x 13” x 4.3”. It can handle weights of up to 44 pounds although you may want to check the load rating of your roof if you plan to add several bikes to your roof. The bike wheel will need to be between 20” and 29”; with a maximum width of 3”. However, if you’re interested in carrying a fat bike you can check out the Thule roof rack parts and get an adaptor which will allow you to carry your fat bikes (tire width up to 5”). This rack is designed to accommodate carbon frames and locks your bike into position over the wheel; you won’t even need to remove the front wheel first. There is only one color option; aluminum. The great thing about this Thule bike roof rack is that it can be fitted to Thule crossbars or to practically any square bar. The bars need to have T-tracks; these can be 20mm x 20mm or 24mm x 30mm. It is very easy to fit the Upride to your vehicle but you will need the crossbars in place already. 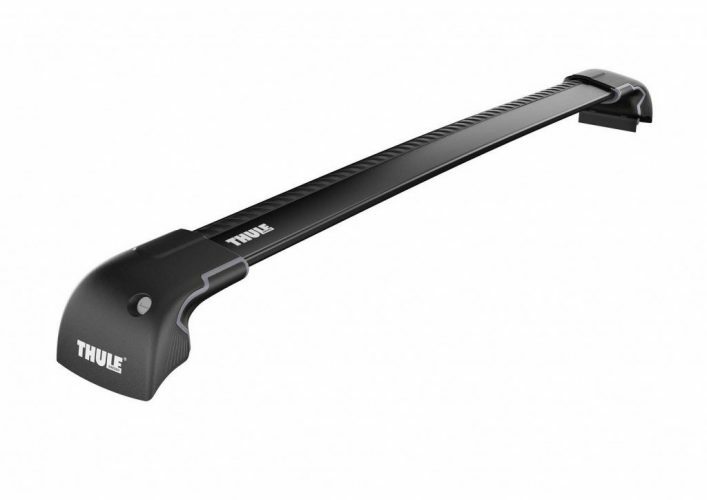 You can purchase Thule bars as part of your Thule roof rack system or you can use it with any existing bars. You can even fit this to the Thule Aeroblade. The first step is to make sure the locking brackets on your Upride are in line with the crossbars on your vehicle. You can then slide the Upride directly into the T tracks; don’t forget to remove any end caps first. You’ll notice two levers sticking up next to where the front tire goes; once you have selected the position for the Upride you simply push these levers down; they will lock the Thule bike roof rack into position. To ensure it can’t be moved there are locks built into the handles; simply secure these locks. You can then slide the bar backward to select the size of your bike wheel. The clamp that goes over the wheel will lift up, allowing you to place your bike in the cradle. As soon as it is in the position you bring up the second side of the wheel clamp; both clamps rest against the tires. There is an easy turn knob on this bracket which you tighten to ensure the clamp holds the front wheel solidly. The rear wheel is held in place with a simple strap; pull this as tight as you need. To finish you turn the key in the rear of the Upride and pull the end out. A security cable comes out with it; wrap this around your bike and re-secure the end into the Upride base. Lock this and your bike is not only clamped in position but it can’t be removed from the Upride which can’t be removed from the vehicle. The same key does both locks. The Upride Thule bike roof rack system is the perfect accompaniment to your Thule roof bars; allowing you to carry almost anything alongside the bike. 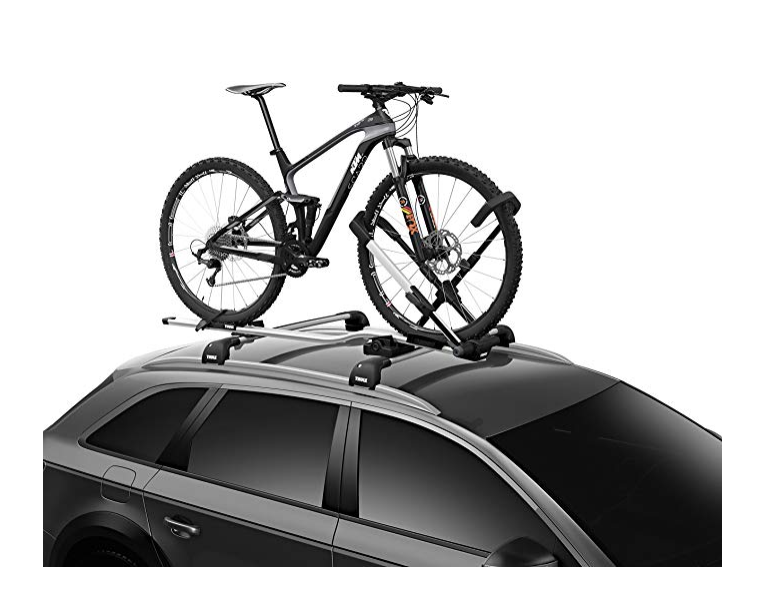 An alternative option if you need a Thule bike roof rack is to choose the ThruRide. This offers the same ease of use but in a different format. Again, you’ll need to fit the crossbars first before you can use this. It is compatible with most factory racks, the Thule square bars, and the Thule Aeroblade; having a T track is not essential when fitting this rack as it can be strapped onto standard bars. The ThruRide weighs significantly less than the Upride, coming in at just 6.2 pounds. This does mean it can only handle bike weights up to 35 pounds which may be an important consideration. You’ll also note that it can only accommodate a tire width of 3”; you can’t use the Thule adaptor to make this rack accept fat bikes. 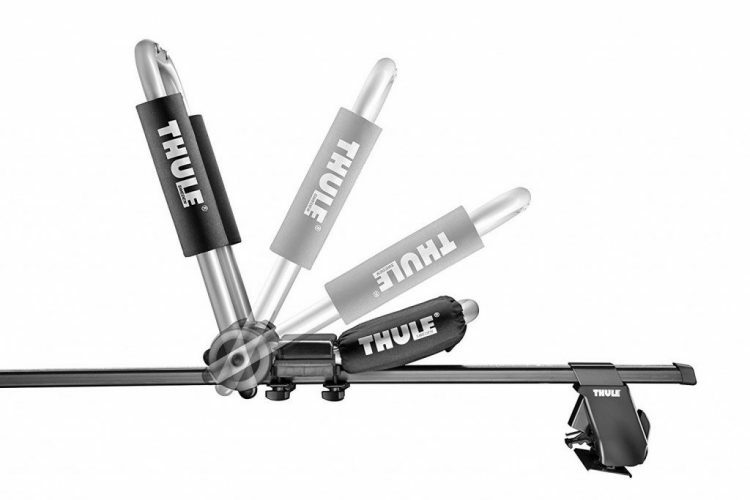 It is important to be aware that this Thule bike roof rack system clamps through the axle of your bike; you’ll need to remove the front wheel. It has a one-handed hood design that fits any axle between 12mm and 20mm. It can also be used for 9mm quick release hubs. The ThruRide uses a clamp which expands to accept your bike and then clamps into position via a precision dial; this ensures the bike is held firmly in place without placing too much pressure on the axles. Fitting this rack is as simple as the Upride Thule bike roof rack. You’ll need to start by removing the end caps and then sliding your ThruRide into the T track on your crossbars. Again two levers will be sticking up each side of the ThruRide where you have slid it onto the cross bars. Simply push these levers down to lock the rack into position and then turn the key to ensure they cannot be accidentally moved. There is just one lever on the rear clamp. Now you’ll need to remove the axle pin from your front wheel and take the front wheel out. Slide the pin back in and secure it properly. You’ll then be ready to lift the bike onto the rack; the front axle pin should sit in the front clamp; sliding underneath the designated metal hook. Next, pull the lever up and over; it will clamp down over the axle. There is also a lock built into this to ensure that the bike cannot be removed from the rack. The rear wheel is fastened into place with a standard ratchet strap; just tighten it and your ThruRide Thule bike roof rack system is locked in position with your bike ready to go; just don’t forget to take your front wheel with you. You may be interested in knowing that the Thule ThruRide is 53” long by 6” x 3.5”. It is made of powder coated steel and comes with the standard Thule warranty covering defects while you own it. The most obvious starting point is what you are intending to use your Thule roof rack for. While you may consider the bike or kayak mounts as separate systems they are an integral part of your decision. 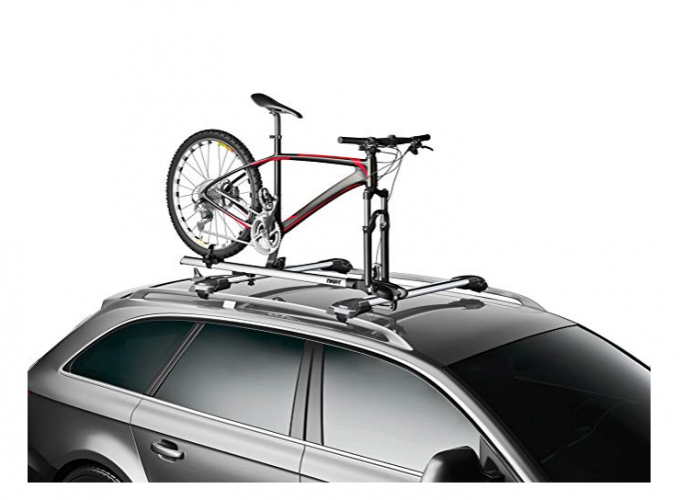 For example, if you want to carry a bike on your roof and you want the best then you need a Thule roof rack system. 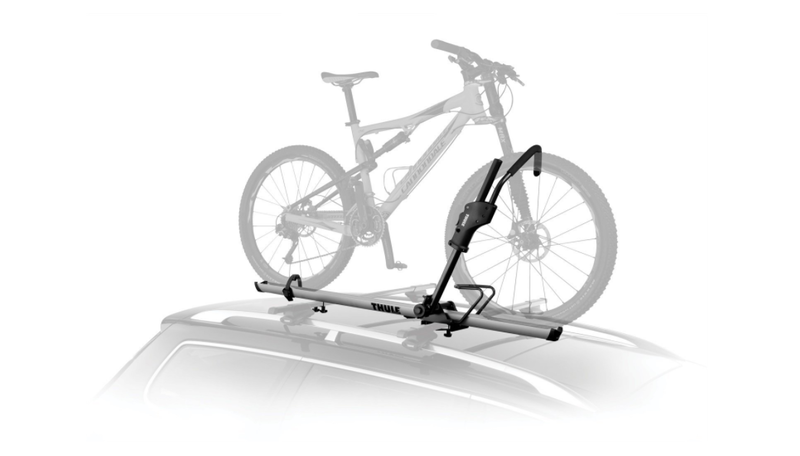 But, you also need the Thule bike roof rack which will fit onto the rack you’re buying. In short, it needs to be viewed as a complete ensemble; not as separate parts. Certain you can consult the Thule roof rack parts catalog to add extras to your roof rack later. But, in the first instance, the most important decision is what will you be carrying. 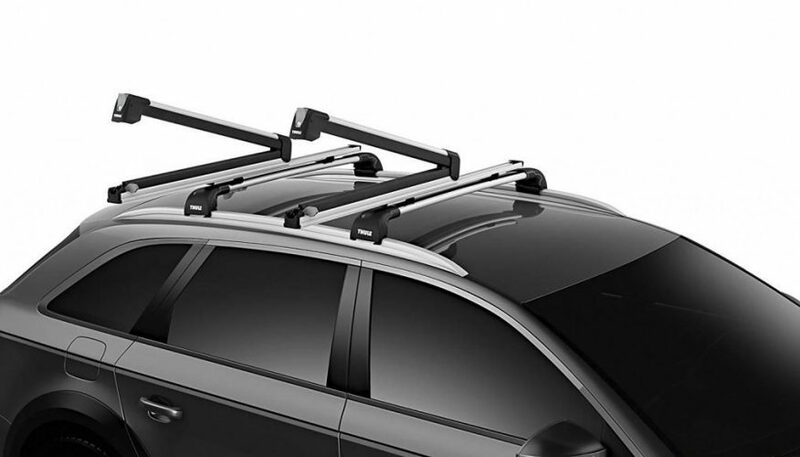 The basic Thule Roof rack is simply adding crossbars to your roof. While it is possible to mount something on top, such as the Canyon XT this may only be suitable if you’re planning on carrying lots of luggage on top of your vehicle. In reality, the better choice is to use the roof bars as the base of your Thule roof rack system and then add the appropriate parts. You can then carry a bike and a kayak or a kayak and a cargo box. The options are virtually endless because you’ve invested in a quality base. Of course, space is limited on your roof; you can’t fit every type of Thule roof rack at the same time; that’s why it is so important to understand what you need from the roof rack first; before you start shopping. Thule is one of the most recognizable brands in the world and with good reason. They have invested a lot of time and effort into making sure every one of their products is high quality. They will last you for years and this is an important consideration when selecting a roof rack system. It is also worth noting that you can purchase the crossbars separate; this is the basis of any Thule roof rack system. 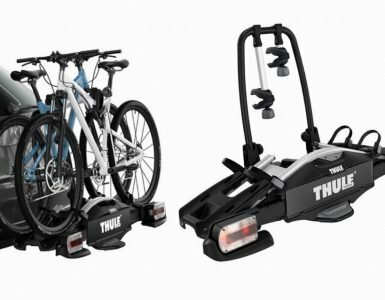 To help make the right Thule roof rack system affordable to you it is possible to purchase the Thule bike roof rack later; or whichever extra part of the system you need. Deciding on your budget is important, there is a huge range of options available and you need to ensure that the rack you ultimately choose is the best one for your needs while remaining affordable. The earlier you think about getting a Thule roof rack system the more time you will have to budget and even save for your purchase; ensuring you get the right one. Your vehicle will dictate the roof rack system you purchase. For example, if you have roof rails running the length of your roof then you’ll need a fitting kit that allows you to clamp the cross bars to the rails. However, there are different mounting kits depending on whether your rails are raised or flushed. Equally, if you have no rails already you may have a gutter that the clamps can attach to or you may need to clamp them round your door frame. The Thule roof rack system allows you to select the bars, mounts and other Thule roof rack parts that fit your vehicle. This doesn’t just mean that you can find something to fit any vehicle; it also means that you can move the Thule roof rack from vehicle to vehicle with very little effort. Usually, a different fitting kit will be enough to allow you to utilize all the functions of your Thule roof rack. This doesn’t mean they will fit every vehicle; it is important to check they are compatible first; before you spend your hard earned money. This may seem like an unusual thing to consider before you purchase a roof rack but it I an important consideration. You probably spent some time deciding the right style and color of the vehicle; this level of attention should be passed on to your roof rack system as well. This is especially true if you are likely to leave the rack in position as many people do. Leaving the rack on means that it is always ready to be used. However, this can also mean that your fuel economy could suffer and you may suffer from wind noise. Wind noise is not normally an issue with the right rack but it can be corrected with a deflector that you’ll find in the Thule roof rack parts catalogue. On the other hand fuel economy directly relates to the look of your roof rack. The more streamlined it is the less it will affect your fuel economy and the better it will look on your vehicle. In short, how your Thule roof rack system looks does matter; consider this when looking at the options available from other manufacturers. Depending on what you are thinking of carrying you’ll need to consider the weight limit of your rack. In fact the first step is actually to find out how much weight your roof can support; you should never exceed this limit. Don’t forget that the roof weight limit will include the weight of the rack; that’s why you need to know the rack weight limit before you start loading it up. In general an aluminum rack will be mightier than a steel one and it should be just as strong. When considering the add-on sections of your Thule roof rack you’ll need to add their weight to the weight of the cross bars and fitting kit. You’ll then need to check the weight they can accommodate. Finally you’ll need to make sure your item weighs less than that amount. For example there is no point buying the ThruRide if your bike weighs 40 pounds; it will be too heavy for the rack. Take a look at the Thule roof rack parts list and you’ll quickly realize that there are many ways in which you can personalize and adapt your roof rack. This is great for ensuring you have the best possible rack for your needs. However, not all firms have as impressive an array of accessories. You need to verify this before you buy, having the right accessory can make your life much easier when you need to carry something. It is important to remember that most manufacturers try to make it difficult to use accessories from other manufacturers on their racks; that’s why you need t choose the right roof rack system first time round. Thule has an enviable reputation but not all manufacturers have the same reputation or approach to quality. It is important to consider how well you know a brand before you purchase it. One of the best ways of establishing the reputation of a firm and the quality of their products is to take a look at the social media sites. Forums are generally very good as there will be plenty of people providing honest opinions about a specific product. Of course you do need to remember that even with the best manufacturer there can be faults in products; the general consensus of a forum should be that the rack is good. Reading the few negative comments will help to make you aware of potential flaws but you need to remember that you can’t keep everyone happy all the time! As a follow on from reputation you should also consider the level of customer support offered. This is partly indicated by the warranty they are prepared to supply. However, having a ten-year warranty is no use if the company is only around for 6 months. It’s best to make sure you have a well-established company that you can trust before you part with your cash. Another feature that is worth considering is security. Once your Thule roof rack is in position you should be able to lock it there; preventing anyone from removing it without your authorization. This will also give you a secure surface to lock items to that are stored on the roof rack. However, not all roof rack systems offer this function. If you think that you will be leaving your vehicle anywhere that could make it vulnerable you should consider making sure there is a way to lock the rack to your car. The same is also true when you add parts to your rack; such as the Thule bike roof rack systems; if these don’t lock into position you may find that your expensive bike disappears when you’re not looking. Most roof racks have an element of plastic on them. In general, this is to protect the items you’re carrying on to protect your vehicle. Plastic is much more likely to break than metal so you need to be aware of the plastic parts on your intended roof rack system. If the rack will still work effectively even with the plastic broken then it’s worth getting; if that’s not true you’ll be better looking elsewhere. The majority of the Thule roof rack systems use the same approach. The first step to fitting is to purchase your crossbars, towers, and mounting kits. These are covered in more detail in the next section. Every Thule roof rack should come with a fitting guide; helping to ensure that you can get it onto your vehicle as quickly and efficiently as possible. However, the basics remain the same, your crossbars need to fit into a tower using the appropriate fitting kit that secures it to your vehicle. By doing this you can add two crossbars to your roof or you can add more. In fact it is possible to put 4 or 5 on your roof and create your own lattice structure which will support the load you have in mind. The key to selecting the right Thule roof rack is to decide on what you need it to do first; in essence you’ll need to work from the top down. It should be easy to fit your Thule roof rack system but if you have any issues you’ll find there are a number of guides on the internet which can help you to choose the right components and fit them securely to your chosen vehicle. As soon as you’ve done it one time you won’t find it an issue again. This is the best place to start. These are usually sold in pairs and can be bought in a variety of lengths depending on the size of the bar. The 2mm thick square bars are available in a variety of lengths between 42 inches and 60 inches. 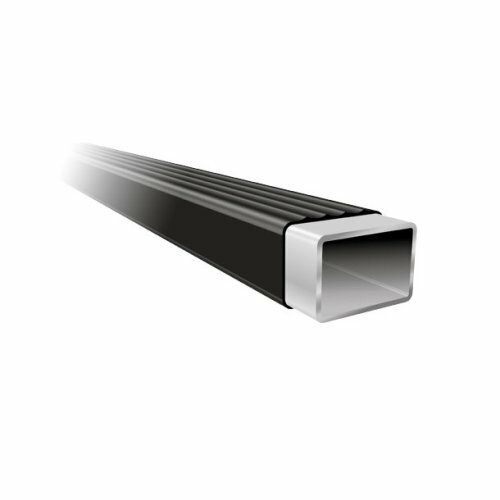 If you need longer then Thule offer a 3mm square bar which ranges from 64 inches to 86.5 inches. The Aeroblades are also offered in an array of lengths between 36 inches and 64 inches; these are the more expensive option but they do look good and offer less wind resistance. This reduces the wind noise, the chance of whistling and can help your miles per gallon. If you need to attach your crossbars to your vehicle and you don’t currently have roof rails along the length of your vehicle then you’ll need to purchase towers. Equally, if you have rails running the length of your vehicle already then you’ll need to purchase the tower that is designed to accompany your car. It’s worth noting that the fitting kit can also be used to describe the clamp section of the tower; this allows Thule to sell a universal tower option and you to just purchase the fitting kit that clamps the tower to your door frame. In the case of existing rails on your vehicle, your tower will depend on the style of your rails. The most common option used to be raised roof rails. However, many modern cars have adopted flush roof rails instead and some even have a track inset into the roof. The tower will clamp into the track or around your rails. As rails can be square, round or aerodynamic it is important to get the right tower for your vehicle. Once these are securely attached you can add your roof bars. It is essential to choose the bars first and then check what you need to securely fasten them to your vehicle. All towers are also adapted to the type of rail you are using. It will have a designated slot where the Aeroblade can slide into and be secured. The same is true if you prefer to have the square bars. The top of the tower will be shaped to accommodate your cross bars. In many cases there is a square hollow opening at the top; this allows you to slide your square bars through and then clamp them into place; again this can be done with a knob or a specialized tool. To finish it is important that you cover the end of your crossbars with an end cap. This will protect the bars from the rain which could cause corrosion. There are other towers which can support the distinctive shape of the Aeroblade; you’ll need to decide which roof bars you want before you purchase the towers. You can also find towers for roofs with gutters and roofs with nothing on at all; there really is an option for every occasion. These are designed to clamp round either the gutter on the edge of your vehicle or into the top of your door frame. When clamping into your door frame they use a small pad to take the weight on the roof of your vehicle without damaging your paintwork. A metal piece is shaped to fit inside your door. This is usually only a couple of mm thick but very strong. The thinness is to ensure it doesn’t interfere with the opening and closing of your doors. You can then tighten the clamp into position; ensuring that it won’t come off while you’re driving. Some clamps simply use a twist knob while others prefer to be tightened in place with either a spanner or a special tool. The more specialized it is the harder it will be for someone to remove the tower and your roof bars. It is worth noting that the Thule roof rack systems allow the fitting kits to lock into position on your vehicle; not all roof rack system has this option. That’s an important consideration. You should be aware that there is an array of Thule roof rack parts that can accompany your basic roof rack system. The parts can range from a simple end cap to a replacement locking mechanism or another way of securing items to your Thule roof rack system. It could even be the opportunity to purchase a wind deflector or an artificial gutter pack. The point is that the range of Thule roof rack parts on offer should give you everything you need to carry any load safely and securely. This is not something that all manufacturers can offer and you should consider this before you purchase a rack. The customer service team at Thule is very supportive. They can help you to find the Thule roof rack parts you need whether they are an addition or a replacement for a part that has been lost or even broken. Most Thule roof rack products are covered by their limited lifetime warranty. This only applies to the first owner of the system and the damage/breakage must be due to defective materials; not simply wear and tear. The best Thule roof rack is the square bars bought as a pair. This is because they can be easily connected to any vehicle with the right fitting kit. They are versatile, strong and durable. However, Thule offers an impressive array of roof racks; from the bike roof rack system to one that can carry your kayak wherever you’re going. Providing you check out the buying guide and find the Thule roof rack parts that you need you’ll be able to carry any items safely, securely and confidently. The fact that the Thule roof rack system looks good at the same time is a bonus.